I’ve wanted to write another useless rant about idiocy in our lives as a governing policy (for example, 1st class railroad cars being worse than 2nd class but more expensive or how “express” is translated into Ukrainian as “??????????? ?” or “?????????? ?”, both meaning “accelerated” or “sped-up”) but I have a bit of more pleasant news. I’ve spent the rest of GSoC money on BeagleBoard and it took about 15 days to deliver it (which is rather impressive by local standards). So I hope to start hacking on it too (I’m pretty sure it would be good for both FFmpeg and me if I learn ARM assembly and about NEON unit). In my opinion they would really benefit from having built-in network adapter (there’s a place for it on PCB too) though; since this is not Mac, saying that USB should be enough for everything is rather lame. Here’s the thing either Compn, known for his passion to document codecs, or Mike, known for his passion to diagrams, charts and codecs, should have done loooooong time ago. While the same information may be obtained from Multimedia Wiki, a graphical layout should be more handy for claims like “… include reverse-engineering of all Real video formats” here. I am also aware of list of supported codecs in MPlayer documentation but it’s also boring and not very useful as a reference. Here’s how I like it — green status for supported codecs, red for unsupported. But from a glance on it you can see what’s missing and what should be added to my beloved video conversion tool. Note: I know that we have to enhance FFmpeg in other areas than different formats support (filter system, for example). Patches welcome. FFmpeg release — probably we will have one Really Soon Now. Previous release was before I started developing for FFmpeg. RV3/4 is improving bit by bit. For now most troubles lie in incorrect motion vector predictions for B-frames. I hope to fix it one day (or preferably that someone else will fix it but that’s even more unlikely). SwScaler is slowly moving to be usable under LGPL. Probably it will be only x86 SIMD code that will be left under GPL. PB-frames support was added. So the only one who cares about Intel codecs (Benjamin, son of Lars) can watch i263 with lavc decoder now. 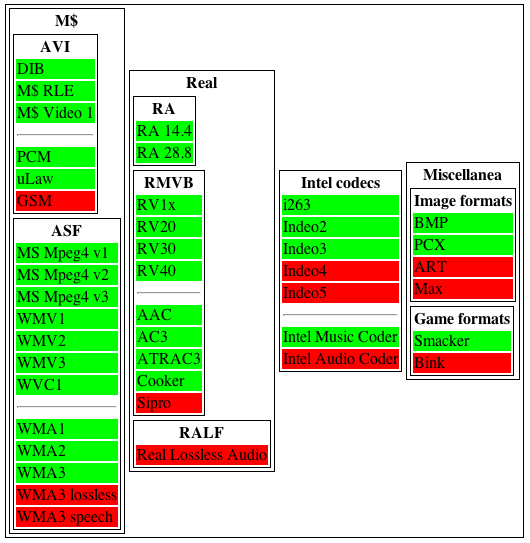 I took some time to understand ELBG code in lavc and wrote simple 15bit MS Video1 encoder. Patch pending. I’ve tried to RE BMV (video format employed in Discworld II and Discworld Noir). Discworld II decoder is in ScummVM sources, so I give a shot on DW Noir which is unlikely to be supported by any opensource engine. While figuring out header and container format was piece of cake, finding out audio compression scheme was easy (boy, they do like SWAR! ), I have troubles determining which function is used for video decoding. More news will follow eventually. You are currently browsing the Kostya's Boring Codec World blog archives for March, 2009.